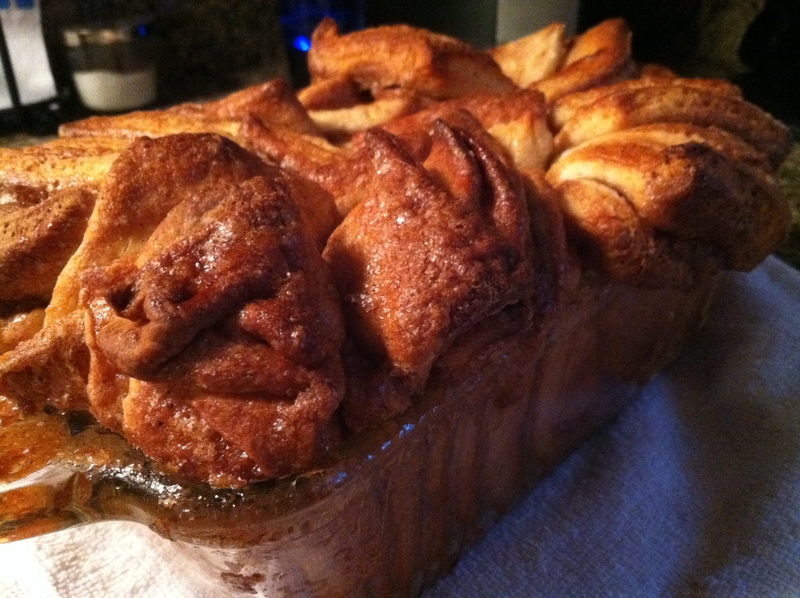 So one of my absolute favorite sweets right now is this cinnamon pull apart bread. I will admit, I stumbled across it online a short time ago so this is not a Derek original, though I did make some changes here and there. Listed below is the recipe and pairings… let me know what you think! In a measuring cup or bowl combine your warm milk and water (100-115F). Stir in the yeast and 1/4tsp of sugar. Place the measuring cup in a warm place (I put it on the stovetop while the oven is preheating) and allow the yeast to activate, roughly 15 minutes. The liquid should be creamy and have a significant bloom on top. In a mixing bowl, combine the sifted flour, sugar, and salt. Add your beaten eggs, vanilla and yeast mixture and begin mixing, starting at a slow speed and working up to medium. Add the melted butter gradually (in 4 or 5 increments), mixing the dough after each addition. The dough becomes sticky but avoid adding flour unless the dough is wet after mixing. Once done mixing the dough should be relatively firm but slightly tacky to the touch. Transfer the dough on a lightly floured work surface. Knead for 6 to 8 min until you have a smooth, elastic dough. Place the dough in a lightly oiled bowl and cover with a towel. Place the bowl in a warm, draft free, location to allow the dough to rise. Once again, I use my stovetop while the oven is heated. However, if you use your stovetop or any other form of direct heat (heating pad, etc. ), make sure it’s not too hot. You do not want to start cooking the outside of your dough, it will ruin the batch. Allow the dough to rise until doubled in size, approximately 1-1.5 hours (it has taken as long as 2 hours for me before). While the dough is rising make your filling. In a medium bowl mix your brown sugar, granulated sugar, cinnamon, nutmeg and black pepper until well integrated. Break apart any brown sugar clumps. Once the dough has risen, turn it back out onto a lightly floured surface. Knead briefly (3 or 4 folds) to get excess air out of the dough. Begin flattening the dough into a rectangle with the heels of your hands, then finish using a rolling pin. You want a rectangle roughly 12” x 20”. Brush the rectangle with butter, then evenly spread your sugar & spice filling. Lighty grease (using butter or shortening) a 5”x9” baking pan (standard bread pan). Using a knife or pizza cutter, cut the dough into six even strips along the short side. Layer the strips of dough on top of each other, and cut into four separate rectangles 4” long. Stand the rectangles vertically in the greased dish, staggering slightly to fill as much space as possible. Cover with plastic wrap and set aside at room temperate to rise until it fills the dish, approximately 45 minutes. Cover with plastic wrap and let stand about 45 minutes or until the dough reaches at least the edge of the mold (it does not double volume swells but enough). Uncover and place in the 350F oven for 35 minutes, the top should be well browned. You do not want to undercook or you will have raw dough in the center and bottom. Let’s face it, everybody’s oven is different, and 350F isn’t the same for all of them. I know for mine if I want 350F I need to set it to 365F. You know your oven and its quirks, you’ll have to make some judgement calls on your own here. Once done remove from heat and let rest for 15 minutes before serving. Enjoy!!! As far as wine pairings are concerned… I would go with a nice Tawny Port or Madeira. I personally prefer ports from Niepoort (their 10yr Tawny was called “the golden standard” of tawny ports by Wine Spectator), Casa de Santa Eufemia, Quinta do Noval (their 1968 Colheita is life-changing good!) or Quinta do Infantado. As far as Madeira you can’t go wrong with Rare Wine Company, preferably their New York Malmsey or Boston Bual. Tags: cinnamon bread, cinnamon pull apart bread, madeira, perfect pairings, perfect pairings at home, port. Bookmark the permalink.